The Federal Reserve is expected to maintain the current target interest rate of 0% to 0.25% when it meets Tuesday and Wednesday. We'll know for sure when the Federal Open Market Committee releases its policy statement around 2:15 p.m. on Wednesday. 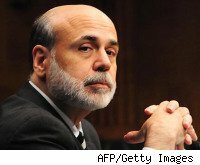 But with the unemployment rate at 10% and analysts predicting it will barely drop to 9.9% by the third quarter of 2010, Federal Reserve Chairman Ben Bernanke would be committing political suicide if he raised rates now, just as Congress decides whether or not to support his second term as chairman. Nor do analysts expect the Fed to speed up withdrawal of its special lending and purchase programs, which have kept the financial markets out of even worse trouble during the crisis. In fact, some are calling for the Fed to increase its lending levels dramatically. My DailyFinance colleague Joseph Lazzaro writes that Paul Krugman wants the Fed to buy another $2 trillion in assets to increase available credit, expand the U.S. economy and help spur job growth. Currently, the Fed's balance sheet is $2.17 trillion. Krugman believes the Fed's job is only half-done -- while Bernanke's efforts to-date have averted a disastrous collapse of the financial system, we don't yet have a robust economy with large job creation. Lazzaro agrees: "Krugman's analysis of credit conditions is on-the-mark: More liquidity is needed and the Fed has to play a larger role by increasing its balance sheet -- an action that would increase job growth by getting more credit to businesses that need it to expand." Even if Bernanke agrees with Krugman, he may not be able to act. Congress is getting nervous about the growing debt levels. Some in Congress are looking to decrease the Fed's role in banking supervision. Others are seeking to require a General Accountability Office (GAO) audit of the Fed's books. Unless he sees clear support from Congressional leaders for moves to increase lending, Bernanke won't buck the trend if he wants to keep his job. Yet economists surveyed by Bloomberg do expect the Fed to start raising the overnight interbank lending rate in the third quarter of 2010. They predict the Fed's rate will reach 1.75% by mid 2011, with an unemployment rate still as high as 9.2%. Can the Fed really start raising rates if the jobless level stays above 9%? Obviously it has the power to do so, but will it?